In a large skillet over medium high heat brown ground beef and drain excess fat. Add onions, bell pepper, garlic and saute' 2-3 minutes. Add tomatoes, tomato sauce, water, soy sauce, Italian seasoning and bay leaves. Bring to a simmer, reduce heat to medium low, cover and cook for 30 minutes. Add elbow macaroni, stir, cover and cook another 25 minutes or until the pasta is done and the liquid is absorbed. I noticed your comment over on Noreen's Kitchen and had to check you out. I printed out your goulash recipe - hubby is going to love this tonight! Thank you!!! It looks so good! Thank you very much! Hope you guys enjoy! Please let me know how it turns out! Larry, you old wolfe. One of the gents on the Primo forum mentioned a recipe from you. Wow. its been a while. Stay well old friend, and I see your cooking up a storm yet. Good for you. Hey Woody, I knew I recognized that name!! Hope they had good things to say about me!! LOL Thanks for stopping by! 6 cups of water? Is this a soup? Do you mean 6 oz? I don't understand your measurements. I just made soup. Perhaps I can try it again sometime. Yes, I followed the Wolfe's recipe as described. I was worried as I poured 6-cups of water into my 6 quart dutch oven (it came almost to the top of the pot). After letting it simmer 30min, then adding the mac-elbows I knew it would be OK. It turned out great! I have looked for a goulash recipe from my you that my parents made. I used this recipe and just made a few adjustments. First, switch the meat to 1.5 80/20 ground meat, .5 sweet sausage, the water is spot on don't change. The other big difference was my parent's was spicy and a creamy texture. To accomplish this I add 1 tablesoon smoked paprika, 1 tablespoon paprika, .5 tablespoon cayenne pepper when adding water step. Followed recipe otherwise to the letter until end. After the elbow macaroony is cooked I add 1 cup sour cream, 1 cup shredded cheese and 1/4 cup franks. The recipe now is more of what I recall or the spicy Hungarian goulash. Again water and tomatoes are perfect. Enjoy either way. I really like the sound of those changes!! was really good! came out great! Glad you enjoyed it thank you for giving it a try! Great recipe! My husband loves it! Have made this a few times now. Everyone loves it! How do I print this recipe? It's sounds delicious. Right click in the body of the recipe and select print..
they call it american chop suey where im from but this is really good! thanks! this was a huge hit with friends, recipe provide wonderful leftovers for me the next day. It's delicious. 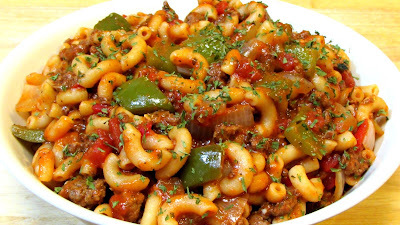 My only goulash go to recipe! Wonderful recipe but i did not have a pot big enough to hold all plus 6 c water, so i mad at macaroni separately then added to sauce. Might be too dry, i will get a bigger pot next time.